Home Celebrity Salman Khan Bio On Wikipedia Was Edited To Abusive Words. Find Out. Salman Khan Bio On Wikipedia Was Edited To Abusive Words. Find Out. Salman Khan is the indisputable biggest star in Bollywood and highly successful. He has a huge fan following, but people are there who did not go well with him and always try somehow to downgrade him by some means. With the world of the Internet every individual has got power, and it is not still used in the right way. One such incident we found out on the Wikipedia’s Bharat page, Bhai’s upcoming movie, a remake of South Korean film named Ode To My Father. Salman Khan can’t be ignored. You can Hate him, Love him but you can’t ignore him. Some way or the other he is always in the news. The person who may have done that must not be a fan of Salman Khan. But, what’ll happen to edit all these things to this abusive language. Salman Khan is a superstar loved across the Globe, and it’s not hidden. The individual who have done this did not stop here, he went further ahead and wrote many more disrespectful things about Bhaijaan. Interestingly, Salman Khan’s look from the Bharat was out yesterday. But look like someone didn’t like this. 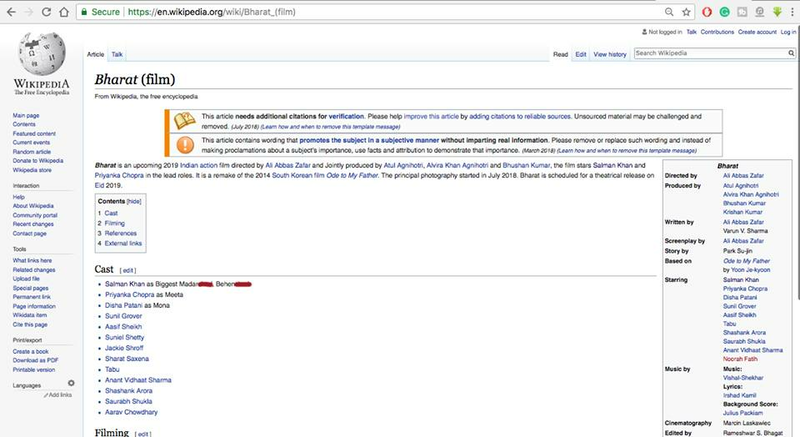 Later everything was cleared and was back with the correct information on Wikipedia. The Movie is in the news for quite some time. A few days back Disha Patani was injured while practising some stuns. The shooting of the Movie is also started, and the Mahurat shot was also done. The movie is expected to release on Eid 2019.